Improved greenhouse gas (GHG) emission efficiency of production has been proposed as one of the biggest potential advantages of cultured meat over conventional livestock production systems. Comparisons with beef are typically highlighted, as it is a highly emissions intensive food product. In this study, we present a more rigorous comparison of the potential climate impacts of cultured meat and cattle production than has previously been made. Warming impacts are evaluated using a simple climate model that simulates the different behaviors of carbon dioxide (CO2), methane (CH4), and nitrous oxide (N2O), rather than relying on carbon dioxide equivalent (CO2e) metrics. We compare the temperature impact of beef cattle and cultured meat production at all times to 1,000 years in the future, using four synthetic meat GHG footprints currently available in the literature and three different beef production systems studied in an earlier climate modeling paper. Cattle systems are associated with the production of all three GHGs above, including significant emissions of CH4, while cultured meat emissions are almost entirely CO2 from energy generation. Under continuous high global consumption, cultured meat results in less warming than cattle initially, but this gap narrows in the long term and in some cases cattle production causes far less warming, as CH4 emissions do not accumulate, unlike CO2. We then model a decline in meat consumption to more sustainable levels following high consumption, and show that although cattle systems generally result in greater peak warming than cultured meat, the warming effect declines and stabilizes under the new emission rates of cattle systems, while the CO2 based warming from cultured meat persists and accumulates even under reduced consumption, again overtaking cattle production in some scenarios. We conclude that cultured meat is not prima facie climatically superior to cattle; its relative impact instead depends on the availability of decarbonized energy generation and the specific production systems that are realized. Cultured meat is an emerging technology in which animal muscle cells are produced through tissue culture in a controlled factory or laboratory environment, in contrast to traditional whole-animal livestock systems (Stephens et al., 2018). Other commonly used terms include clean, in vitro, lab-grown, or synthetic meat. Reducing the environmental impacts of meat production, and particularly greenhouse gas (GHG) emissions, is generally highlighted as a significant potential advantage of cultured meat (Tuomisto and Teixeira de Mattos, 2011; Post, 2012). Despite recent research and popular interest in cultured meat, and the frequency with which its supposed climate benefits are reported, the potential temperature impacts of cultured meat production have not yet been investigated. Livestock production systems are associated with a number of GHG emissions, and have made a significant contribution to anthropogenic climate change (Reisinger and Clark, 2018). Broadly, the livestock themselves result in emissions of methane (CH4) and nitrous oxide (N2O) from their manures, and further methane from enteric fermentation in ruminants. Further GHGs associated with, but not directly emitted by, animal production include the loss of nitrous oxide from fertilizer application to grow their feed, carbon dioxide (CO2) emissions from the conversion of land for pasture or feed production, and CO2 emissions resulting from fossil fuel based energy generation, for example in tractor fuels or the manufacture of fertilizers (in addition to by-product CO2 also formed in fertilizer production, Dawson and Hilton, 2011). While there is a very large range in emissions associated with different animal production systems, they are generally shown to emit significantly more per unit of food output (for example emissions per kg final product or per kg protein) than plant-based systems, and beef is typically highlighted as among the most emission intensive food products (Clune et al., 2017; Poore and Nemecek, 2018). Proponents of cultured meat have suggested that bypassing the wider biological processes of the whole animal can result in lower emissions per unit of meat produced, as the direct animal emissions are avoided, and cultured systems could be designed to more efficiently convert inputs into the desired output (meat), thus minimizing the emissions associated with the production of these inputs. A trade-off may exist in significant energy demand to maintain the controlled manufacturing environment that essentially replaces some of the animal's biological functions (Mattick et al., 2015b); and large uncertainties remain in what viable, animal-free, growth media may look like (Stephens et al., 2018) and hence their potential resource demand. Despite the remaining unknowns in large-scale cultured meat production, a small number of studies have undertaken speculative life cycle assessments (LCA) to predict the environmental footprint of cultured meat (Tuomisto and Teixeira de Mattos, 2011; Tuomisto et al., 2014; Mattick et al., 2015b; Smetana et al., 2015). The suggested GHG emissions per unit of cultured meat produced (“carbon footprints”) vary significantly, as they are based on different production systems and assumed inputs, and take alternative approaches in anticipating future developments. Nonetheless, the GHG emissions per unit of cultured meat are uniformly shown as superior to that of beef where this comparison is made (trends are less clear for other animal products). To date, these comparisons (and most others evaluating the relative emissions intensity of different products or activities) are based on carbon dioxide equivalent (CO2e) metrics that relate the emissions of different GHGs to carbon dioxide. However, such metrics may be misleading, and provide a poor indication of actual temperature response (Pierrehumbert, 2014). Individual gases differ both in the amount they change the atmospheric energy balance (radiative forcing), and hence lead to warming, and how long they persist in the atmosphere. Per molecule, methane results in significantly greater radiative forcing than carbon dioxide, but has an atmospheric lifespan of only around 12 years (Myhre et al., 2013) in contrast to the millennial persistence of carbon dioxide (Archer and Brovkin, 2008). Nitrous oxide has a much greater radiative forcing per molecule than both methane and carbon dioxide, and an atmospheric lifetime of just over 100 years (Myhre et al., 2013). The most commonly used carbon dioxide equivalence metric, the 100-years Global Warming Potential (GWP100), equates each gas by integrating the amount of radiative forcing that a one-off emissions pulse would exert over a 100-years period (Myhre et al., 2013). If we are to consider the climate effects of ongoing production, however, we need to consider the impact of continued emissions rates of each gas. GWP100 based comparisons, among other limitations, do not sufficiently capture the temporal behavior of different gases, and in particular fail to express the cumulative nature of continued carbon dioxide emissions, and hence can relatively overstate the warming impact of methane (Pierrehumbert, 2014). Additionally, due to the short lifetime of methane, any warming it causes is largely undone shortly after emissions are removed, in contrast to carbon dioxide. Inferring relative temperature impacts from GWP100 footprints can therefore be especially problematic where short-lived gases such as methane constitute a significant proportion of emissions, as is the case for beef production. This paper presents the first attempt to compare the potential climate impacts of cultured meat and beef cattle production using an atmospheric modeling approach, rather than relying on carbon dioxide equivalent comparisons. We test a number of cultured meat and beef system emissions footprints under three alternative consumption pathways, comparing the temperature impacts under different production and consumption scenarios at all timescales to 1,000 years. In order to ensure standardization, the atmospheric models, consumption pathways, and representative cattle production emissions all follow Pierrehumbert and Eshel (2015). A literature review was undertaken in April 2018 to screen for cultured meat emissions footprints. As considerable uncertainty remains over what real, large-scale cultured meat production may look like, four different footprints found in this literature review were used to illustrate some of the possibilities. The first cultured meat LCA study, presented in Tuomisto and Teixeira de Mattos (2011), hypothesized a system in which animal embryonic stem cells are grown in a cylindrical stirred tank bioreactor in a medium of cyanobacteria hydrolysate (as the main “feed” input), vitamins and animal growth factors. Animal growth factors are produced from genetically engineered Escherichia coli, and both growth factors and vitamins are considered to be required in negligible volumes, and hence incur negligible environmental impacts (including GHG emissions). The cyanobacteria production is assumed to take place in an open pond, with some synthetic nitrogen use considered in the default case, but either nitrogen-fixing cyanobacteria or “nutrient-rich wastewater” used to eliminate the need for fertilizer inputs in the most optimistic scenarios. Greenhouse gas emissions result primarily from energy use and transport in growing and moving the cyanobacteria to the site of cultured meat production, followed by energy use in cyanobacteria processing and stirring the cell culture tank for 60 days. Residual heat following cyanobacteria hydrolysate sterilization initially warms the culture medium, and following this it is assumed heat generated by the metabolism of cells growing in the culture negates the need for external heating. Greenhouse gas footprints were then estimated based on the conditions and emissions per unit of energy use for three representative regions (Thailand, California, and Spain), with emissions from electricity generation lowest in Thailand and highest in California. The cultured meat output assumed as the functional unit was a “minced-beef type” product with equivalent protein content to low fat meat. For further details see Tuomisto and Teixeira de Mattos (2011). Following through the assumed yields and allocation conventions used in this study (see discussion below), the average emissions footprint was approximately 2.01 kg CO2e per kg cultured meat. As this study represents the most optimistic scenario, we use the lowest value presented in the sensitivity analysis of 1.69 kg CO2e per kg cultured meat, assuming no fertilizer use was necessary for cyanobacteria production and electricity generation uses the lowest Thai emissions footprint. It was not possible to separate out individual greenhouse gases, and so it is assumed that the entire footprint is carbon dioxide emissions. As there was no fertilizer use in the footprint used, and in alternative footprints below other emissions represent relatively small proportions of the total footprint, this assumption is unlikely to significantly affect the results. The second cultured meat footprint used in this study was obtained from Tuomisto et al. (2014). The hypothesized systems are largely as described above from Tuomisto and Teixeira de Mattos (2011), but with some refinements made to the assumed operation of the bioreactor, and a number of plant-based alternative feedstocks considered in addition to cyanobacteria. Wheat or maize feedstocks were assumed to have been grown with the GHG footprints of typical UK production from Williams et al. (2006) and sterilized and hydrolyzed as described above for cyanobacteria. A hollow capillary bioreactor was selected to represent a superior option to the stirred cylinder design above, but in this case also included an energy input in maintaining growth temperature (37°C) for cultured cells. As this study still represents an optimistic but potentially more realistic footprint than suggested by Tuomisto and Teixeira de Mattos (2011), an intermediate value of 3.67 kg CO2e per kg cultured meat was selected from the range of results presented, assuming maize feedstock (with a greater production footprint than cyanobacteria but less than wheat), and an average of the best- and worst-case bioreactor yield scenarios. This footprint is also assumed to be composed entirely of carbon dioxide emissions. In practice, nitrous oxide emissions would also be expected from a proportion of the nitrogen inputs in growing maize, but it was not possible to separate out this component of emissions. The omission is again considered unlikely to significantly influence conclusions, as discussed below in the context of results for other cultured meat systems. The remaining two cultured meat footprints were both taken from Mattick et al. (2015b). In this study, a two-step culturing process is assumed: after 5 days of proliferation of muscle stem cells, the bioreactor is drained and filled with a different medium for 72 h of cell differentiation and mass gain. It is assumed that the main constituents of the culture media are peptides and amino acids from soy hydrolysis, glucose from corn starch, and again a negligible volume of growth factors. In contrast to the more speculative approach of the two papers above, this study bases its assumptions on the metabolic requirements and yields of cultured meat on data from Chinese Hamster Ovary (CHO) cell proliferation (Sung et al., 2004), as a previously tested analog for cell culture conditions. Corn starch microcarrier beads provide a scaffold around which cells proliferate, and the process is assumed to take place within stirred-tank bioreactors. Energy is required for aeration, mixing and temperature regulation during the culture phase. Finally, the bioreactors are cleaned between each culture batch by rinsing with sodium hydroxide and heating to 77.5°C. See Mattick et al. (2015b) for further details. As more optimistic estimates were already demonstrated in the two papers above, the average cultured meat footprint was used rather than the low end of the sensitivity analysis. This GHG footprint was 6.64 kg CO2, 0.019 CH4, and 0.0013 kg N2O, giving a total GWP100 footprint of 7.5 kg CO2e per kg cultured meat (disaggregated emissions from Carolyn Mattick, pers. comm.). To represent the upper end of proposed emissions footprints for cultured meat production, the result from the high end of the sensitivity analysis in Mattick et al. (2015b) was also used. Here, lower cell densities are achieved at the end of the proliferation phase, no further biomass growth is achieved in the differentiation phase, and the biomanufacturing facility building size and energy footprint are treated as comparable to a pharmaceutical plant, rather than a brewery as in the default scenario. This resulted in a footprint of 25 kg CO2e per kg cultured meat. It was not possible to extract the individual gas composition from the sensitivity analysis, but for this study we assume that the gases constitute the same proportions as in the baseline case, resulting in 22.1 kg CO2, 0.062 CH4, and 0.0043 kg N2O per kg cultured meat. A further emissions footprint for cultured meat is also provided by Smetana et al. (2015), but as some details regarding the functional unit, system boundaries and production methods assumed in this study were unclear, and the carbon dioxide equivalent footprint presented was similar to the result at the high end of the sensitivity analysis in Mattick et al. (2015b), it was not used in this study. Three representative beef footprints were used following Pierrehumbert and Eshel (2015) to illustrate some of the variation in quantity and composition of emissions associated with contemporary beef production systems (Table 1). The lowest footprint for all gases is demonstrated by production at an organic Swedish ranch from Cederberg and Nillson (2004). This is an extensive, low-input (no pesticides or synthetic fertilizers, but organic pig manure imported) system that achieves birth rates of approximately one animal a year and fast weight gain, hence low methane emissions per output. An alternative footprint composition is shown in the Brazilian pasture system from Cederberg et al. (2009), which is also an extensive, low-input system, but methane emissions per unit beef produced are significantly greater due to slower animal weight gain. CO2 emissions from production are likely actually lower than in the Swedish case (rather than equal, as shown in the table) as this footprint includes emissions resulting transport from Brazil to Europe; however, these are more than offset by likely emissions resulting from deforestation, which are not included here but returned to in the discussion. Finally, the highest beef footprint included is a pasture system in the Midwestern USA from Pelletier et al. (2010). This system also achieves relatively fast animal weight gain, and so methane emissions are equivalent to the Swedish system, but this is achieved through an energy and input intensive management that results in high carbon dioxide and nitrous oxide emissions. For further details see Pierrehumbert and Eshel (2015) and the original studies referenced. Two further footprints demonstrating emissions from a Midwestern USA feedlot and the average for Swedish beef production included in Pierrehumbert and Eshel (2015) were omitted from this study for clarity, as they provided intermediate emission profiles that were similar to those described above. Table 1. 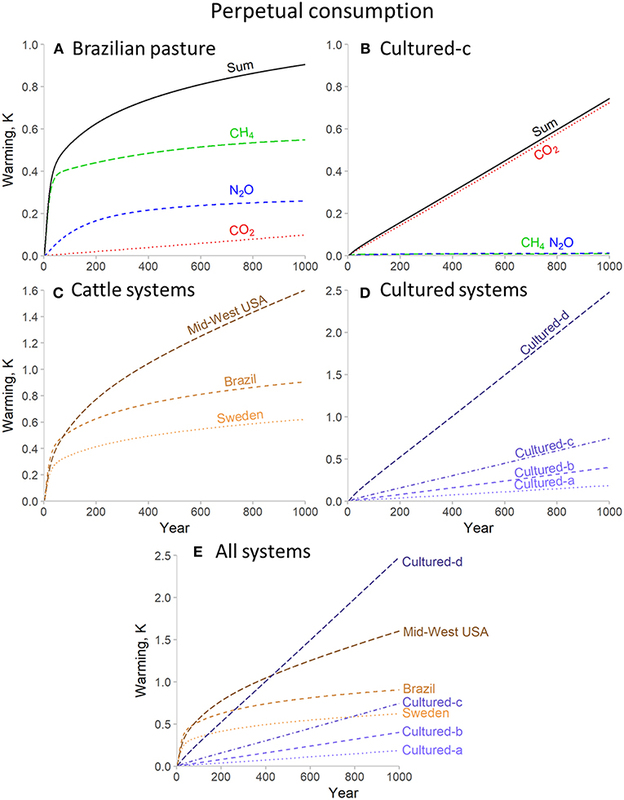 Emissions profiles of cultured meat and beef cattle production, expressed as individual gases and total IPCC 5th Assessment Report 100-Years Global Warming Potential carbon dioxide equivalent (GWP100 CO2e) per kg of meat output (either cultured meat or bone free beef). As these beef footprints are not completely harmonized (e.g., the emissions incurred in the transport of Brazilian beef to Europe noted above), the emissions described for each system may represent methodological differences between studies, such as different system boundaries, co-product allocations and LCA databases, rather than differences between the beef production systems themselves. Comparing individual LCA studies can be problematic, even for the same product (de Vries et al., 2015), and there are significant challenges in standardizing agricultural LCAs (Adewale et al., 2018). For the purposes of this study, these footprints provide contrasting case-studies with a different balance of GHG emissions to illustrate the distinct climate impacts of each gas, but should not necessarily be taken as globally representative or definitive, standardized beef LCAs. Emissions footprints for every system are shown in Table 1. It should be noted that all cultured meat carbon dioxide equivalent footprint estimates, including the high end of the sensitivity analysis, are lower than those of every cattle system in this study. Three alternative consumption pathways were used to illustrate the dynamics resulting from the alternative GHG footprints, with impacts from all systems shown for 1,000 years. The first scenario is based on constant, very high levels of meat consumption: 25 kg per capita per annum (roughly the contemporary beef consumption rate in the USA) for a population of 10 billion. This pathway is intended to explore the temperature impacts of unrestrained consumption and illustrate the distinct climate impacts of different greenhouse gases under sustained emissions. (Note that here and for all other scenarios, we only model aggregated global totals, and the consumption described is assumed to lead directly to the associated production (and hence emissions). We do not address issues surrounding, for example, food waste, access, and distribution, despite their importance in designing a sustainable food system (Garnett, 2013), as our focus is on demonstrating the relevant climatic principles). where Cm is the peak (and in this scenario, also initial) consumption rate, which declines after time tm (= 100 years) with time constant, τ = 50 years. This scenario illustrates the difference between long-term warming impacts of each gas when their emissions decline toward 0.
where Cm is again the peak consumption rate, occurring in this case at time tm (again 100 years here), reached at a rate governed by δ, where δ=tm(ln (CmC0))-0.5 such that the initial consumption rate, C0 is as described above. Temperature responses were derived using an energy-balance climate modeling approach following Pierrehumbert and Eshel (2015). Annual emissions of each gas, as determined by the system type and consumption trajectories described above, are used to determine the change in radiative forcing and consequently warming over time. Carbon dioxide forcing was calculated using a function that models change in atmospheric concentration of CO2, incorporating ocean uptake, and a logarithmic relationship between changes in CO2 concentration and resultant forcing (following Pierrehumbert, 2014). For CH4 and N2O, atmospheric concentrations were calculated assuming the gases persist in the atmosphere for 12 and 114 years, respectively, with forcing derived from these concentrations using linearized radiative efficiency coefficients from Forster et al. (2007). For CH4 this forcing was increased by a factor of 1.45 to incorporate stratospheric water vapor amplification and positive ozone feedbacks. The transient energy balance climate model presented in Pierrehumbert (2014) was used to calculate warming resulting from these changes in forcing. A two-box ocean system is used whereby a shallow, mixed ocean layer warms rapidly (within years) in response to changes in forcing, but the deep ocean is warmed (through this mixed layer) on a much longer timescale. This two-box ocean system has the important effect of adding a delayed warming response, which can also result in some continued warming even when forcing is stable or declining (Held et al., 2010). An equilibrium climate sensitivity of 3 K per doubling in the atmospheric concentration of CO2 and a short-term transient climate sensitivity 2/3 of the equilibrium sensitivity were assumed. All climate model outputs are provided in a Supplementary Table in addition to being illustrated in the results section below. The first consumption pathway, continuous consumption at very high rates (Figure 1) illustrates the scale of warming that would result from large-scale meat production from current beef cattle or hypothesized cultured meat systems. This scenario also demonstrates the distinct climate impacts of each gas. As illustrated for the warming resulting from each gas in the Brazilian pasture system (Figure 1A), there is immediate, significant warming from CH4, but under sustained emission rates this largely stops increasing after a few decades (by this point the atmospheric concentration of CH4 has reached an equilibrium, and hence the forcing it results in remains the same, but there is still a slight long-term increase in warming due to the significant time lag for the temperature response of the deep ocean). This equilibrating dynamic is also observed for N2O, but on a scale of a few centuries rather than a few decades. In contrast, as a significant proportion of CO2 emissions persist indefinitely, no equilibrium forcing is reached for this gas, and hence warming continues to increase for as long as emissions are sustained. These dynamics are illustrated very strongly by comparing cattle to a cultured meat production system (Figure 1B). Cultured meat emissions of CH4 and N2O are relatively small and so do not significantly contribute to overall warming dynamics; instead we see a long-term perpetual increase in warming driven largely by the rate of on-going CO2 emissions. Figure 1. Warming impact for perpetual consumption at very high rates (250 Mt per year) for beef cattle and cultured meat production systems for 1,000 years. (A,B) illustrate the individual and combined warming impact of separate greenhouse gases for representative beef cattle (A) and cultured (B) systems. (C–E) show total warming impacts for all systems. The wider system comparisons provide further demonstrations of these dynamics. 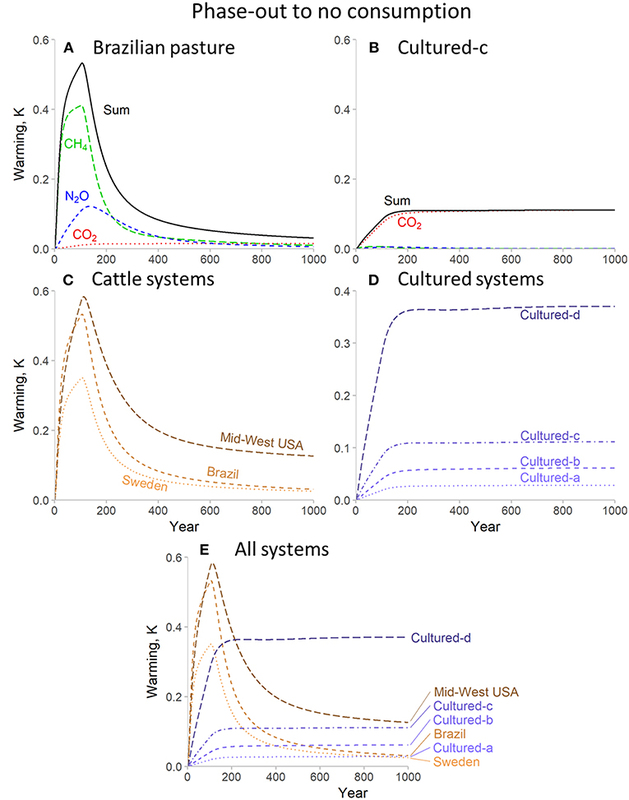 Among the beef cattle production systems (Figure 1C), the Mid-Western USA pasture system shows a much greater degree of long-term warming than the Brazilian system, despite only a marginally higher carbon dioxide equivalent footprint, due to the greater proportion of CO2. The Swedish ranch system compares favorably to both, as the CO2 component is low and hence we see limited long-term increase in warming, but due to greater production efficiency than the Brazilian system, CH4 (and N2O) emissions are also lower, and hence the forcing that results once atmospheric concentrations reach equilibrium is less. Among the cultured meat production systems (Figure 1D), the warming is driven largely (or entirely for “cultured-a” and “-b”) by CO2 emissions, and so there is perpetually increasing warming, the slope of which depends on the rate of annual CO2 emissions. Despite concerns over the potential omission of some CH4 and N2O emissions in the cultured-a and -b footprints as noted above, the marginal impact of these gases for cultured-c, where these data were available, suggests that overall trends would be similar. 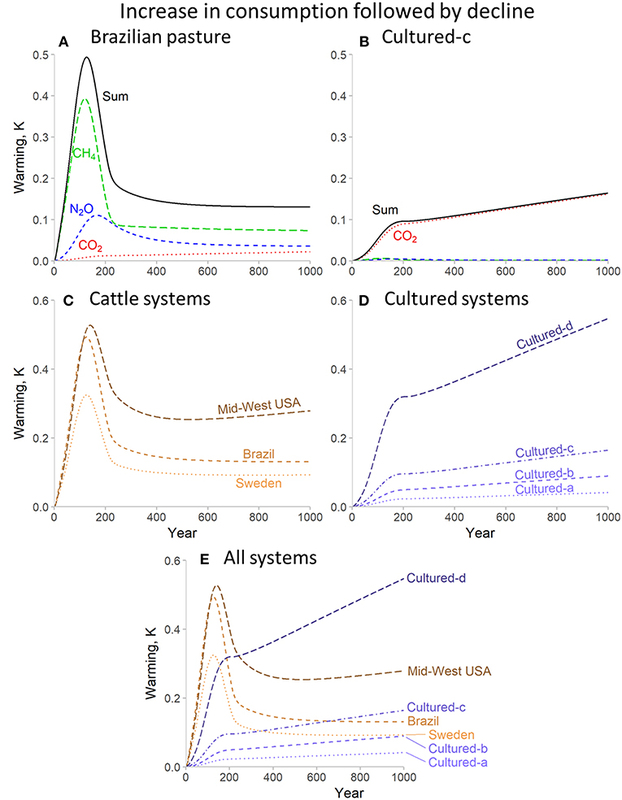 Bringing all system types together (Figure 1E) we see that the two most optimistic cultured meat footprints, cultured-a and cultured-b, are sufficiently small that these systems do indeed have a lesser climate impact than cattle systems. These two cultured meat systems remain superior to even the best beef cattle production system into the very long term (1,000 years), although their relative advantage declines over time and by the end of the period modeled is significantly less than might be implied by comparing carbon dioxide equivalent footprints (cultured-a footprint = 1.69 kg CO2e kg−1 meat, Swedish = 28.6; but by t = 1,000 the temperature impacts are +0.18 and +0.62 K, respectively). The most striking example of these dynamics is provided by cultured-d, the production scenario at the high-end of the sensitivity analysis in Mattick et al. (2015b). Despite having a lower carbon dioxide equivalent footprint that all cattle systems here, within 200 years of continued production the Swedish system is superior, and by 450 years is outperformed by even the worst cattle system here (despite having only 57% of its carbon dioxide equivalent footprint). This system is then increasingly outperformed by all of the cattle systems the longer that production is maintained. An alternative aspect of the different temporal dynamics of each gas is revealed by the scenarios in which production declines toward zero after 100 years, as shown in Figure 2. Once emissions of CH4 and N2O cease the warming these emissions resulted in is reversed over timescales largely dependent on the atmospheric lifespan of each gas (Figure 2A). In contrast, the warming due to CO2 is not reversible within the timescales modeled here, and so warming caused by CO2 persists (shown more clearly in Figure 2B). As a result, while the warming from cattle (Figure 2C) systems declines, the warming from cultured meat production persists indefinitely at a fixed level based on the cumulative CO2 emissions accrued up to the point at which production ceases (Figure 2D). Figure 2. Warming impact for consumption at very high rates (250 Mt per year) followed by a decline to zero for beef cattle and cultured meat production systems for 1,000 years. (A,B) illustrate the individual and combined warming impact of separate greenhouse gases for representative beef cattle (A) and cultured (B) systems. (C–E) show total warming impacts for all systems. The potentially more realistic scenario of an increase in consumption followed by a decline to more sustainable levels is shown in Figure 3. For the Brazilian beef cattle systems (Figure 3A), the warming resulting from CH4 and N2O grows rapidly in line-with increasing production, but then stabilizes at a new, lower level responding to the new emissions rates. For CO2, however (again shown more clearly in the cultured meat example, Figure 3B), the reduction in emissions rate slows the rate of further warming, but this is added to the warming caused by historical emissions, which persists. The overall consequences of these dynamics depend on our climate objectives. The cattle production systems show greater peak warming within this time-frame (except for the comparison between the Swedish system and the highest footprint cultured meat system), but as a result of the persistence of the large-scale CO2 emissions in the early periods of production for cultured meat, any long-term benefits of this production are further reduced compared to cattle systems. Figure 3. Warming impact for consumption at very high rates (250 Mt per year) followed by a decline to zero for beef cattle and cultured meat production systems for 1,000 years. (A,B) illustrate the individual and combined warming impact of separate greenhouse gases for representative beef cattle (A) and cultured (B) systems. (C–E) show total warming impacts for all systems. As originally stated in Pierrehumbert and Eshel (2015), the temperature impacts of very large levels of beef consumption, under any of the systems explored here, are significant and likely incompatible with our climate goals. Despite the bold claims and superior carbon dioxide equivalent footprints, however, cultured meat is not necessarily a more sustainable alternative. In the most optimistic cultured meat production footprints, emissions are competitive with cattle systems for CO2 while avoiding the other gases: this is unambiguously superior from a climate perspective. However, the long-term advantage over cattle is not as dramatic as may be suggested by simple GWP100 comparisons. For the most conservative cultured meat footprint used here, which still had a lower carbon dioxide equivalent footprint than any cattle system in the study, the long-term temperature impact of production is dramatically worse than any cattle system. Furthermore, as emissions from cultured meat are predominantly composed of CO2, their warming legacy persists even if production declines or ceases (in the absence of active removal of this CO2 from the atmosphere). Replacing cattle systems with cultured meat production before energy generation is sufficiently decarbonized and/or the more optimistic production footprints presented here are realized (assuming they can be), could risk a long-term, negative climate impact. In this study, beef was selected as the livestock meat to compare with cultured systems due to its especially high carbon dioxide equivalent footprint. It is striking how poorly these footprints correspond to long-term temperature impact, indicating the significant influence of the different atmospheric lifespan of each gas not adequately captured by the GWP100 metric. The 100-years time-frame demonstrates the increasing divergence between GWP100 footprints and warming impact, but the relative exaggeration of the impacts of sustained methane emissions is apparent well before this (any period beyond 100 years). GWP100 CO2 equivalents also fail to highlight some of the significant shorter-term differences between methane and CO2, neither reflecting the immediate (within ~20 years) large-scale impacts of initially increasing methane emissions nor capturing the reversal of warming resulting from decreasing (or halting) emissions (which is also the case for nitrous oxide in the longer-term). As on-going emissions of short-lived gases such as methane behave so differently to CO2, even over immediate, policy-relevant timescales, we need to consider alternative appraisals for activities where emissions are largely composed of methane: here, cattle production, but other biogenic sources such as rice production, or fossil fuel sources such as natural gas leakage would need to consider similar dynamics. It is not sufficient to make broad climate claims based on GWP100 carbon dioxide equivalent footprints alone. In order to investigate these issues, emissions associated with an activity must be provided in a disaggregated form allowing the assessment of each gas, yet these data are not generally available at present, and we urge researchers to provide them in the future (Lynch, 2019). It has been argued that as the emissions from cultured meat are primarily from energy use, they may be significantly reduced in the future if energy generation is decoupled from emissions (Tuomisto and Teixeira de Mattos, 2011)—and given the long timeframe used here, large scale energy decarbonization will be essential well within this period to prevent very significant climate impacts irrespective of any emissions associated with food production. In the least optimistic cultured meat scenario here, however, the magnitude of energy required is such that sufficient decarbonized energy generation appears unlikely in the near to medium term. Assuming an energy footprint of approximately 360 MJ per kg cultured meat (high-end of the sensitivity analysis in Mattick et al., 2015b), the production of 25 kg per capita per annum for a global population of 10 billion would require around 90 EJ energy per annum, 22.9% of the 393 EJ total global energy consumption in 2015 (International Energy Agency, 2017); hence unrestrained consumption would result in a significant proportion of global energy supply going toward growing lab-grown meat in the absence of low-energy production systems. Decarbonized energy generation would also eliminate a proportion of the CO2 emissions from cattle systems, and so for this analysis we used footprints as presented under contemporary energy emissions assumptions. Additionally, the timing of a large-scale decarbonization of energy generation would have significant impacts on wider climate targets, including determining the extent of on-going methane emissions that are compatible with a given temperature ceiling. As cultured meat is an emerging technology, wider improvements in efficiency of production may reduce its emissions footprint in the future, in addition to the decarbonization of energy generation. This, too, could also apply to cattle systems though, employing mitigations or technologies or moving to more efficient systems (Rivera-Ferre et al., 2016). Indeed, it could be argued that comparing extant cattle production with hypothesized cultured meat systems presents a biased parallel. The speculative nature of all four cultured meat footprints tested here is borne of necessity, as to date there are no LCA of actual cultured meat production (at least in the public domain), despite manufacturer claims that a commercial launch is imminent (Stephens et al., 2018). Given the unknowns in this new form of production, we must be aware that impact assessments may change, and continue to take a systematic approach (Mattick et al., 2015a). There is a need for much greater transparency from cultured meat manufacturers, with relevant data available to interrogate any environmental claims. In addition to the broad nature of each footprint, some specific elements of the cultured meat LCA remain unclear due to their speculative nature. In the default approaches from Tuomisto and Teixeira de Mattos (2011), for example, a proportion of emissions incurred in the production of cyanobacteria are not allocated to cultured meat, instead presumed assigned to food supplements. The potential for any co-products from cultured meat production will depend on the systems that might be realized. They should also be handled similarly to any co-products from cattle production, such as leather; but the treatment of livestock co-products in LCAs can be complex, and is not well-standardized at present (Mackenzie et al., 2017). The nature of the functional unit—the unit of output to which emissions are assigned—also remains speculative in the case of cultured meat. If protein rather than “meat” was taken as our functional output the footprints would show even greater differences between studies, with Mattick et al. (2015b) assuming 7% protein by weight, compared to 19% in Tuomisto and Teixeira de Mattos (2011) and Tuomisto et al. (2014). Comparing impacts on a per protein (or wider nutritional) basis will be important as more detailed and/or real production footprints become available. Even with a generic meat functional unit, as used in this study, there may still be further differences not captured here. In Mattick et al. (2015b) the functional unit is 1 kg of cell biomass: any further processing or additional ingredients required to convert this biomass into an edible form or a conventional meat product analog would also need to be included for a full life cycle assessment comparing final meat products. Tuomisto and Teixeira de Mattos (2011) assumed their cultured meat system output is a “minced-beef type of product,” but may still differ from cattle beef in nutritional or sensory attributes, with further processing (and hence steps to consider in a life cycle assessment) potentially required if a complete beef analog is sought. The impacts of any processes to produce different meat products, such as steaks, may be even greater, and more complex tissue engineering of this type is not anticipated in the near-future (Stephens et al., 2018). Processing of livestock products can also be associated with considerable emissions (Poore and Nemecek, 2018), and so system boundaries must consistently include these in future work comparing environmental impacts of final products ready for consumption. Spared land-use has been presented as another significant advantage of cultured meat production (Tuomisto and Teixeira de Mattos, 2011), and this land could entail a further climate benefit by being used for carbon sequestration. This may also be a factor in improved cattle production however, including simply more efficient use of current grasslands (Godde et al., 2018). Land-use associated carbon fluxes are often poorly standardized in agricultural footprinting approaches (Adewale et al., 2018), and were excluded here. These land-use carbon fluxes may have significant impacts. For example, significant deforestation has resulted from pasture expansion, and including the CO2 emissions resulting from this would greatly increase typical Brazilian beef footprints (Cederberg et al., 2011). At the same time, grassland soils contain significant quantities of organic carbon, and could potentially sequester even greater amounts under appropriate management (Conant et al., 2017). Further detail and standardization in land-use emissions and sequestrations is required in the future, including an appraisal of likely alternative land-uses following sparing of current agricultural land. Although this study is concerned with the climate impacts of meat production, a wider context must also be considered. A number of other environmental impacts are associated with beef production, such as water pollution and acidification (Poore and Nemecek, 2018), and cultured meat may provide benefits in these wider impacts; but again, caution should be advised until reliable LCAs are available for actual production systems. Conversely, we must also consider the wider benefits that might be provided from meat production systems, including associated co-products, the provision of ecosystem services, their socioeconomic role in rural communities, and their landscape or cultural value (Rodríguez-Ortega et al., 2014). It has been argued that cultured meat production is a potentially transformative technology, and so social assessments must also be made to anticipate the disruption (positive or negative) that may be caused (Mattick et al., 2015c), alongside environmental impacts such as climate change. As a concept, it has been suggested that cultured meat overcomes some of the ethical problems of livestock production (Schaefer and Savulescu, 2014), but has also been criticized as a problematically techno-centric, profit-motivated approach (Metcalf, 2013). Hocquette (2016) questions the broad need for cultured meat, suggesting that there are already alternative solutions that we could employ to overcome problems with our food system. Finally, any climatic or wider benefits that may be possible through replacing livestock systems with cultured meat depends on how people perceive and ultimately consume cultured meat products (i.e., as a direct replacement or in addition to conventional livestock products). Early research suggests consumer reluctance to replace conventional with cultured meat, with public willingness to eat cultured meat dependent on a number of personal concerns and anticipated benefits (Bryant and Barnett, 2018). The scale of cattle production required for the very high levels of beef consumption modeled here would result in significant global warming, but it is not yet clear whether cultured meat production would provide a more climatically sustainable alternative. The climate impacts of cultured meat production will depend on what level of decarbonized energy generation can be achieved, and the specific environmental footprints of production. There is a need for detailed and transparent LCA of real cultured meat production systems. Based on currently available data, cultured production does not necessarily give license for unrestrained meat consumption. JL and RP designed the study and carried out the modeling. The manuscript was written by both authors following an initial draft by JL. This research was funded by the Wellcome Trust, Our Planet Our Health (Livestock, Environment and People—LEAP), award number 205212/Z/16/Z. Thanks to Carolyn Mattick and Hanna Tuomisto for providing further details on their cultured meat life cycle assessments and providing feedback on the system descriptions in this paper, and to Alexandra Sexton for helpful feedback and discussion. We would also like to thank the two reviewers for their constructive comments. Cederberg, C., Meyer, D., and Flysjö, A. (2009). Life Cycle Inventory of Greenhouse Gas Emissions and Use of Land and Energy in Brazilian Beef Production. Technical Report Göteburg. Sweden SIK. Report no 792. Cederberg, C., and Nillson, B. (2004). Livscykelanalys (LCA) av Ekologisk Nötköttsproduktion i Ranchdrift Technical Report Göteborg. Sweden SIK. Rapport no. 718. Forster, P. M., Ramaswamy, V., Artaxo, P., Bernsten, T., Betts, R., Fahey, D. W., et al. (2007). “Changes in atmospheric constituents and in radiative forcing,” in Climate Change(2007): The Physical Science Basis. Contribution of Working Group 1 to the Fourth Assessment Report of the Intergovernmental Panel on Climate Change, eds S. Soloman, D. Qin, M. Manning, Z. Chen, M. Marquis, K. B. Averyt, et al (Cambridge; New York, NY: Cambridge University Press). International Energy Agency (2017). World Energy Balances, 2017. Myhre, G., Shindell, D., Bréon, F.-M., Collins, W., Fuglestvedt, J., Huang, D., et al. (2013). “Anthropogenic and natural radiative forcing,” in Climate Change (2013): The Physical Science Basis. Contribution of Working Group 1 to the Fifth Assessment Report of the Intergovernmental Panel on Climate Change, eds T. F. Stocker, D. Qin, G.-K. Plattner, M. Tignor, S. K. Allen, J. Boschung, A. Nauels, et al (Cambridge; New York, NY: Cambridge University Press). Tuomisto, H. L., Ellis, M., and Haastrup, P. (2014). “Environmental impacts of cultured meat: alternative production scenarios,” in 9th International Conference on Life Cycle Assessment in the Agri-Food Sector (San Francisco, CA). Williams, A. G., Audsley, E., and Sandars, D. L. (2006). Determining the Environmental Burdens and Resource Use in the Production of Agricultural and Horticultural Commodities. Main Report. Defra Research Project ISO205. Cranfield University and Defra, Bedford. Copyright © 2019 Lynch and Pierrehumbert. This is an open-access article distributed under the terms of the Creative Commons Attribution License (CC BY). The use, distribution or reproduction in other forums is permitted, provided the original author(s) and the copyright owner(s) are credited and that the original publication in this journal is cited, in accordance with accepted academic practice. No use, distribution or reproduction is permitted which does not comply with these terms.